Question: Our organization follows a progressive discipline plan and one employee has received several verbal and written warnings for mistakes. Each mistake on its own is relatively minor, but it’s apparent the employee is not going to improve and his mistakes are cumulatively costing the company. Is there a threshold where a number of minor infractions can amount to just cause for dismissal? Answer: It is always advisable to have a discipline policy in place. Progressive discipline can take many forms, but I always recommend employers not lock themselves into a strict sequence of disciplinary steps without reserving any discretion to take circumstances into account. An example of this would be a policy that provides that any first offence will result in a verbal warning, a second offence will result in a written warning, and so on. 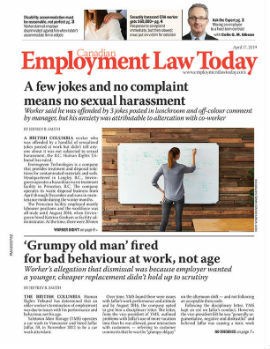 In that context, the employer can find itself in the situation where an employee is guilty of particularly serious misconduct, but the employer is bound by the wording of its own policy to impose nothing more than a verbal warning. If they attempt to take a stronger position, the employee may complain that the employer has not followed the policy it drafted.